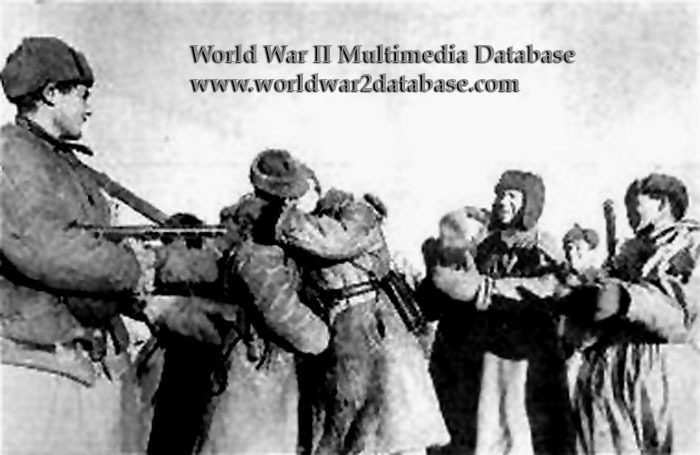 In this still from a propaganda film, Red Army soldiers celebrate the linkup of spearheads at Sovyetskiy by the Soviet 4th Tank Army under Andrei Grigoryevich Kravchenko (1899–1963) and 4th Mechanized Corps under Vasily T. Volsky (March 10, 1897 - February 22, 1946). The soldier at extreme left is carrying a PPSh-41 submachine gun. Soviet photographers restaged the meeting of the two units after their initial encounter resulted in heavy combat with large numbers of casualties. The resultant film was circulated throughout the Allied world. The actual encirclement of Sixth Army was completed when the Red Army took the bridge at Kalach by driving two captured German tanks over the bridge while Russian T-34s waited in the heights above the town on November 22, 1942. If Sixth Army had immediately executed an evacuation, they might have been saved, but they lacked fuel for a breakout and units were scattered in retreat before the Red Army's counterattack. Some German units retreating from Kalach went South to safety while others headed for Stalingrad to be trapped in the "Kessel" (cauldron) with their comrades.